Maggie Reagh, BA Classical Philosophy, MA Teaching, CYT, E-RYT 500 began studying Yoga at age 3 with her Mother guided by TV’s, Karen Zebroff. She resumed her practice of Yoga in her twenties after a pre-professional career in Modern dance came to an abrupt end due to lower back, neck, and knee pain. 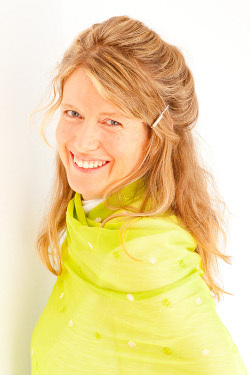 Pattabhi Jois’ Astanga Vinyasa practice brought her to Mysore, India in 2000 to study asana, pranayama and philosophy with BNS Iyengar at the Parakala Mutt where Krishnamacharya did his Vedic studies in the early 20th century. Searching for the source of Krishnamacharya’s work and looking for deeper healing from severe osteoarthritis in her neck as well as chronic anxiety and depression brought her to Chennai, India in 2001 to study at the Krishnamacharya Yoga Mandiram in Chennai, India with the TKV Desikachar family. With T.K.V. Desikachar’s blessings at his father’s shrine, she started teaching Therapeutic Yoga in 2002 in Vancouver, Canada at Capilano University, where she is also a faculty member. In 2008, she met her Iyengar-based Vancouver teacher, Lindsay Whalen, E-RYT 500, CYT. Through her five-year mentorship, Maggie's teaching style changed fundamentally. She refined her knowledge of alignment, props and restorative poses, incorporating this knowledge into her TKV Desikachar-based approach to Yoga Therapy. As a specialist faculty member, Maggie teaches about working with Disabilities, Scoliosis, and Systemic Conditions. She also teaches Yoga Philosophy, Ayurveda, Therapeutic & Teaching Skills, Yoga Therapy Practices, Providing Yoga Therapy, and Professional Practice. In addition to being a part of the Specialist Faculty, she is also the Practicum and Distance Learning Supervisor as well as the Founding Director of Yoga Therapy International (YTI).